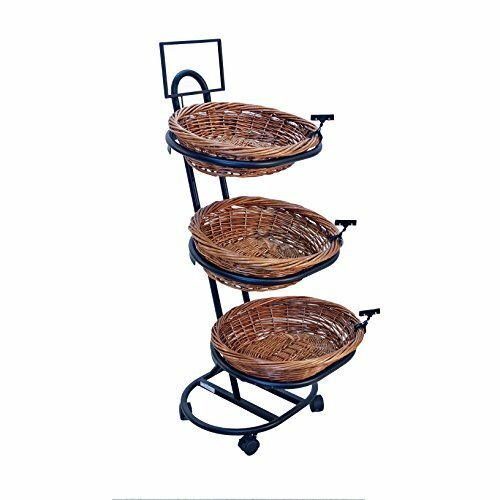 Our Mobile Merchandisers K2346-MB 3-Tier 3 Oval Willow Basket Display with Sign Frame and Sign Clips has a black matte tube steel frame. It stands 54 inches high by 23 inches across. It includes willow baskets, sign frame and sign clips. Basket dimensions: 23"W x 5.5"H x 18"D Overall dimensions: 23"W x 54"H x 29"D Model #: K2846. If you have any questions about this product by Mobile Merchandisers, contact us by completing and submitting the form below. If you are looking for a specif part number, please include it with your message.